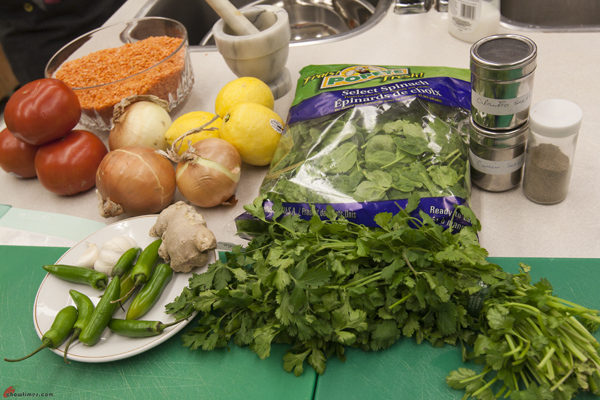 Minoo prepared four recipes for the South Arm Community Kitchen held at the Bethel Church. It looks like that we will continue to meet at the Bethel Church until the summer break in July. We appreciate very much for Bethel Church’s generosity to allow us to use their well equipped kitchen for free. 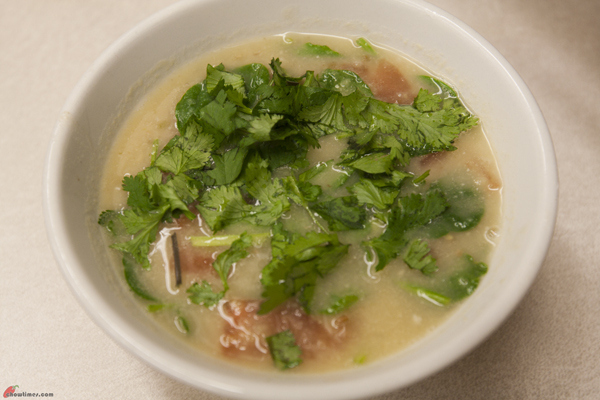 For the starter, Minoo selected a lentil soup recipe. Lentils require soaking (some overnight) before cooking due to the presence of anti-nutrients such as phytic acid and tannins. Lentils can be used to make soup, salad or cook with rice to add protein to the vegetarian diet. This soup gets a gentle heat from jalapeno pepper and a burst of added flavours from freshly squeezed lemon juice and freshly roasted spices. 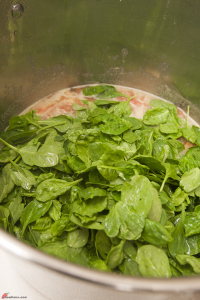 The addition of tomatoes and spinach also adds freshness to the soup. The spinach can be substituted with other green vegetables like kale. 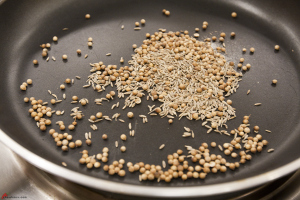 Place the cumin seeds and coriander seeds in a small skillet over medium heat. Dry roast, shaking the pan for 1 minute or tow or until fragrant. 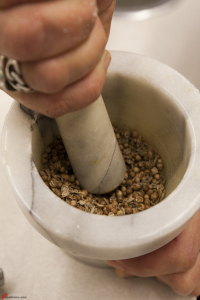 Remove the spices from heat and place in a mortar and grind until fine. Heat oil in a soup pot. 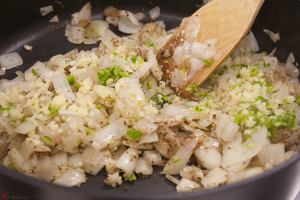 Add onion and cook until soften. Add garlic and cook until the onion is golden. Add spices, jalapeño and minced ginger, cook a another minute. Add lentils and water and bring to a simmer. 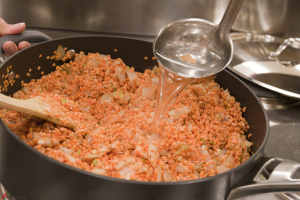 Reduce heat, cover and cook until lentils are tender, about 20 to 25 minutes. When the lentils are soften, puree the soup with an immersion blender. 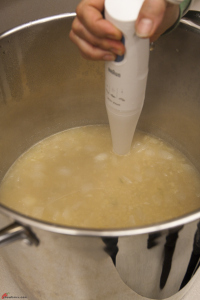 If the soup is too thick, add some water to the consistency preferred. Return the soup pot to the stove. Add the tomatoes and simmer for 2 minutes. Stir in the lemon juice. Season with salt to taste. 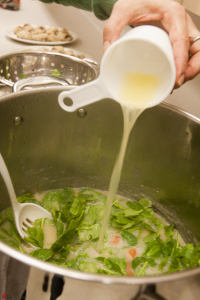 Ladle into soup bowls and serve with chopped cilantro. Whenever i try to make something like this, the soup ends up to be kind of sandy. Does that mean I haven’t soaked the lentils long enough? Is it possible to make this with other beans? Hi emmy, some lentils do not need soaking. 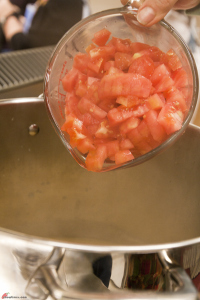 For those recipes that we did in the community kitchens, we only soak them for 10 minutes. You can cook it longer if you like your lentil mushy and soft. You can surely substitute the lentils with other beans but dry beans need soaking overnight unless you can beans.